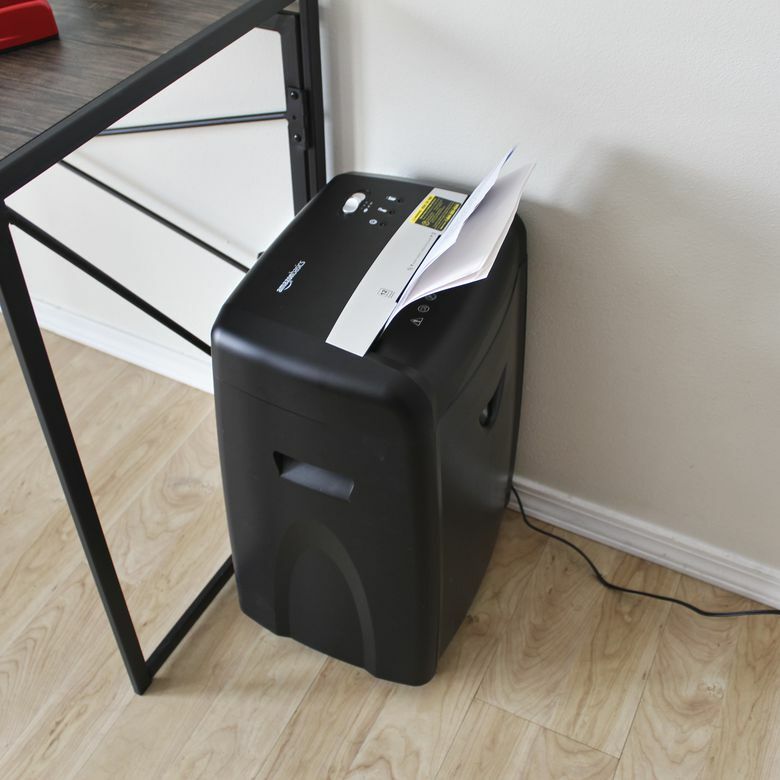 The AmazonBasics 12-Sheet High-Security Micro-Cut Shredder is a tremendous combination of value and security for both homes and offices. Throwing away or recycling sensitive documents, credit cards, and optical discs without shredding them first is a bad idea, but basic shredding doesn’t always cut it. The AmazonBasics 12-Sheet High-Security Micro-Cut Shredder pulverizes your documents into particles that are a mere fraction of an inch wide and less than half an inch long. This is the kind of shredder you need if you’re really serious about protecting your sensitive data, and Amazon has wrapped it all up in a very affordable product. We recently put an AmazonBasics 12-Sheet High-Security Micro-Cut Shredder to the test in our office, tasking it with shredding stacks of documents, credit cards, optical discs, and even unopened junk mail, to see how it holds up against the competition. Shredders aren’t the most attractive pieces of hardware, but if you can say one thing about the AmazonBasics Micro-Cut shredder, it’s that it’s thoughtfully put together. Since it’s on the larger end for personal shredders (14.3 x 11.5 x 21.7 inches, 23 pounds), it’s equipped with casters that allow you to move it around without picking it up. If you do need to pick the shredder up, it has convenient handholds placed on the sides. On the front, you’ll find a small viewport that allows you to see how full the bin is without removing it. The port is difficult to see when the unit is on the floor, but it is a nice touch. The controls consist of a single switch with three positions: Off, Automatic Feed, and Reverse. Indicator lights up top show when the unit is ready to use, overheated, or if the bin isn’t properly inserted. Paper, credit cards, and optical discs are all inserted through the same slot at the top of the unit. Since the same shredding mechanism handles everything, your credit cards and optical discs receive the same micro-cut treatment as your documents. That means this shredder is a more secure method of disposing of credit cards than shredders that use a strip or cross-cut shredding method. The shredder is ready to go right out of the box. It comes in Amazon’s infamous easy-to-open packaging, and once you have it out of the box all you have to do is plug it in. The bin is secured with tape, but you technically don’t even have to remove that before you get started. At eight minutes of shredding between 45-minute cool down breaks, the AmazonBasics Micro-Cut shredder can chew through a surprising amount of documents. Our testing showed that it’s more than capable of shredding the advertised 72 documents per minute, provided that you have them separated out into appropriately-sized stacks before you get started. It takes a little over 10 seconds for the shredder to pulverize a stack of 12 sheets. It even has the juice to shred 15 or more sheets at once without jamming, so you don’t need to worry about accidentally misjudging the number of pages you feed in. Amazon recommends against shredding large paperclips, envelopes with insulation or windows, laminated items, and anything with adhesives, like tape. In our testing, the shredder ate through small paperclips and staples, and junk mail with windowed envelopes, but junk mail with any cardboard included did present a problem. Fortunately, when the shredder does jam, unjamming it is a breeze. The single switch that you use to turn it on and off also has a reverse setting, letting you easily clear most jams. In addition to paper, the shredder is also designed to shred credit cards and optical discs. When you shred a credit card or optical disc with this shredder, you place it into the same feed slot, and the same shredding mechanism, that handles paper. That means credit cards are reduced to tiny chunks, to the point where it’s highly unlikely that anyone will be able to identify your personal information. Since the same shredding mechanism handles everything, your credit cards and optical discs receive the same micro-cut treatment as your documents. In terms of shred size, it’s a micro-cut shredder, which means the particles it generates are smaller than your typical cross-cut unit. The paper basically looks like confetti and is impossible to piece back together. The shreds are still on the larger end of the spectrum for a micro-cut unit, at 5/32-inches wide and 15/32-inches long, but it’s still a really good level of security for the price. Overall, the shredder fails to impress in terms of duty cycle and speed, but it works well enough for home, home office, and light small office use. The shredder has a decently-sized 6.7-gallon collection bin that’s big enough you won’t have to stop in the middle of a job to empty it. Even if you manage to feed it constantly for a full eight-minute run cycle, you’ll still have space left in the roomy collection bin. The tiny shreds generated by this unit are able to settle in quite compactly, and gently shaking it back and forth on its casters can help them settle even further. Even if you manage to feed it constantly for a full eight-minute run cycle, you’ll still have space left in the roomy collection bin. The bin itself is very easy to operate with one hand. It clicks in place for safety, but it’s still quite easy to pop it out even without bracing the unit with your other hand. Once out, the bin can get a little heavy if you’ve managed to fill it all the way to the top, so be careful not to drop it. Using a sound meter, we measured the shredder’s noise output at 66 decibels, which was pretty close to the similarly priced Swingline Prostyle+ that we also tested. This might seem loud, but the sound generated by this shredder is deep and muffled, so in actual usage, it seems quieter than measurements would indicate. Price is where the AmazonBasics 12-Sheet High-Security Micro-Cut Shredder really shines. At $99.99, it’s hard to find a shredder that can match it in terms of security at a similar price point. The Swingline Prostyle+ is available for just a bit more, but it generates much larger shreds and has a smaller collection bin. Other competitors, like the Fellowes Powershred 99Ms Micro-Cut Shredder, generate smaller shreds, but at a much higher price. The Powershred 99Ms, in particular, is priced at $349, which makes the AmazonBasics 12-Sheet unit look like a bargain. It’s hard to find a shredder that can match it in terms of security at a similar price point. If you want a micro-cut shredder with a decent throughput and duty cycle, the AmazonBasics 12-Sheet High-Security Micro-Cut Shredder is what you’re looking for. You can find micro-cut shredders with slightly smaller shred size, but you’ll pay a whole lot more. That said, if you need additional security, the Fellowes Powershred 99Ms Micro-Cut Shredder has a P-5 security level which means it has a shred size of 5/64 x 9/16 inches. That’s about the same length as the shreds generated by the AmazonBasics 12-Sheet unit, but only half as wide. You’ll pay more than three times as much, but the P-5 security level is better suited to especially sensitive documents compared with the P-4 security offered by the AmazonBasics 12-Sheet unit. Interested in other options? Read through our list of the best paper shredders available now. Secure option for shredding sensitive documents, optical discs, and credit cards. The AmazonBasics 12-Sheet High-Security Micro-Cut Shredder is a great piece of hardware for home, home office, and even small office use. It features a micro-cut shredding style at a price that’s more commonly associated with much less secure cross-cut shredders making it one of the best values you’ll find. Product Dimensions 14.3 x 11.5 x 21.7 in. What Are Some Common Tips to Know When Shopping for a Paper Shredder?